New eco-friendly taxi cabs and a smartphone app for hackney cab passengers have been launched in Nottingham. Nottingham City Council unveiled models of next-generation taxi vehicles on March 1 which it wants the city’s whole fleet of hackney cabs to convert to in the forthcoming years. 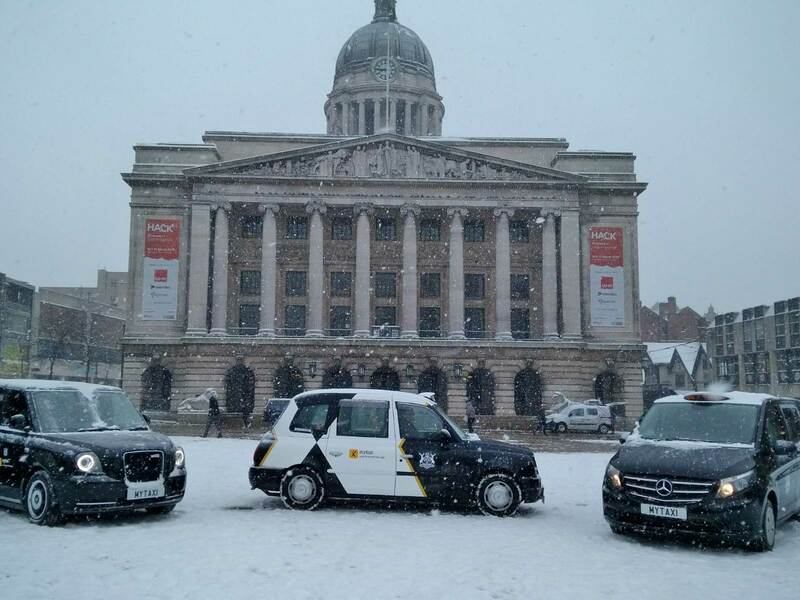 The first of the new electric cabs – an LEVC (London Electric Vehicle Company) e-city vehicle – and a cleaner diesel Mercedes Euro VI were revealed in the Old Market Square, in a new black and white livery being considered as an option for the fleet. Alongside this, the mytaxi app was launched in Nottingham – the first city outside London to get the free smartphone app, which puts people just two taps away from a licensed taxi, and lets drivers get more passengers when they want them. Mytaxi is Europe’s largest e-hailing app, operating in over 70 cities and used by almost 80% of London’s black cab drivers. To celebrate the launch, mytaxi will be offering 50% off all trips throughout March in Nottingham for both new and existing users. Launched in 2009, mytaxi is the leading e-hailing app in Europe, available in over 75 cities within 11 countries. Four mytaxi trips are accepted every one second around Europe through the network of over 120,000 drivers and more than ten million downloads. In partnership with Nottingham City Council, the launch will provide not only skilled and knowledgeable drivers but a guarantee of safe, reliable, convenient and cost-effective travel for Nottingham’s residents. The moves are part of a drive by the City Council to bring the city’s taxi service into the 21st century and up to the standards of Nottingham’s world-class integrated public transport system. Low emission trams and buses are already playing their part in improving the city’s air quality – now the fleet of over 400 hackney cabs are set to become Ultra Low Emission Vehicles (ULEV) or Euro VI (cleanest diesel) by 2020 to help the city achieve air quality standards and support any potential Clean Air Zone. These vehicles offer drivers fuel cost savings of up to £100 a week. The council will be placing orders for a small number of stylish new Ultra Low Emission Vehicle (ULEV) models to lease back to drivers, as well as investing £700,000 of Government funding into a network of electric charging points around the city. Portfolio Holder for Community and Customer Services, Councillor Toby Neal, said: “New low-emission taxis along with a user-friendly e-hailing app will bring our taxi service up to the high passenger and air quality standards as the rest of our superb transport system in Nottingham.